When forces conspire against them from without and within, can their love survive? 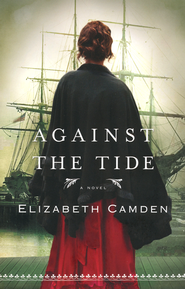 Against the Tide by Elizabeth Camden is a breath of fresh air! It is a very different Christian/Historical Fiction read. Lydia Pallas has had a very unconventional upbringing and has always had a knack for languages, including learning English upon arriving in Boston at the age of nine. We catch up with Lydia several years later as she is working for Admiral Eric Fontaine at the Navy Yard as a translator. Lydia is very content at this point in her life with a good, respectable job, an apartment of her own, and several friends. During her tenure at the Navy Yard working for Admiral Fontaine, Lydia begins to have interactions with Alexander Bainebridge. Over time, Bainebridge turns to Lydia for help with the translation of various, seemingly useless documents. Lydia is prepared to quit translating these documents after she begins to suspect that Bainebridge has feelings for her and is using these random documents as a means with which to see her. Bainebridge offers her a job working for him in his quest to root out the opium trade on the East Coast and across the world. However, this position is short lived as circumstances change suddenly and Lydia's life begins to unravel. I found it unusual that this book had illegal activities in it. Although, like it is discussed in the book - "Is it moral?" Against the Tide is a sequel to The Lady of Bolton Hill. While reading Against the Tide, I felt that I had read similar subject matter before and couldn't put my finger on it until I came across The Lady of Bolton Hill in the back of the book. Hi! I'm Rachelle. I am an aspiring graphic designer and full time Ph.D. student. Please feel free to contact me with questions, comments, post topics, design inquiries, etc! Please stick with me as I transition this blog into my own online space, while juggling grad. school! !